Put yourself in the centre of the action. You’ve never been closer to the action than you are with this 36x wide-angle optical Zoom-NIKKOR ED glass lens. Its optical zoom (22.5–810mm) pulls you in from wide panoramas to crisp close ups. Plus, a side zoom control marks the end of shaky zooms—freeing you to capture great action photos with minimal blur. So whether you’re shooting a mountain vista or zooming in on a snowboarder, say goodbye to missed shots. This lens catches it all. It even allows for macro shooting as close as 0.4 inches! The COOLPIX P500 is ideal for shooting high speed action, so you’re sure to capture the fastest skateboarders, skiers, and windsurfers. It’s armed with ISO speeds up to 3200 and equipped with a five-way Vibration Reduction (VR) Image Stabilization System that reduces the streaky images associated with shaky cameras. The COOLPIX P500 even has a motion detector that identifies moving subjects and then adjusts the camera’s settings to ensure that you won’t miss a frame of the action. You’ll never miss a shot with this versatile camera because it starts right up, has a quick autofocus, and shoots five shots in approximately one second—at full resolution. Plus, multiple Continuous Modes allow for a variety of high speed shooting options up to a blazing 120 frames per second (reduced resolution). When a single picture just isn’t enough, the versatile COOLPIX P500 features a One-Touch record button that lets you shoot Full HD (1080p) movies at 30fps while recording audio with a built-in stereo microphone. It’s great for sporting events because it will record high speed activity in slow motion, catching action missed by the human eye. The COOLPIX P500 also has an HDMI-CEC output for simple playback on your HDTV or computer—so now it’s as easy to watch your own movies as it is to shoot them. The COOLPIX P500 is all you need to shoot eye-catching photographs, thanks to the three-inch, tilting, vari-angle monitor. This 921,000-dot display not only makes it easy to capture, review, and share images, but it also enables you to shoot from unusual angles and tricky vantage points. The Clear Colour Display has a brightness adjustment and an anti-glare coating, so it remains vivid in the most challenging lighting conditions. And for those who want even more compositional freedom, the versatile COOLPIX P500 comes with an eye-level electronic viewfinder. Mountains. Canyons. Sunsets. The glory of these vistas is the breadth and grandeur of their natural beauty. That’s why the COOLPIX P500 includes Easy Panorama Mode that combines multiple shots into a seamless 180- or 360-degree panoramic picture. 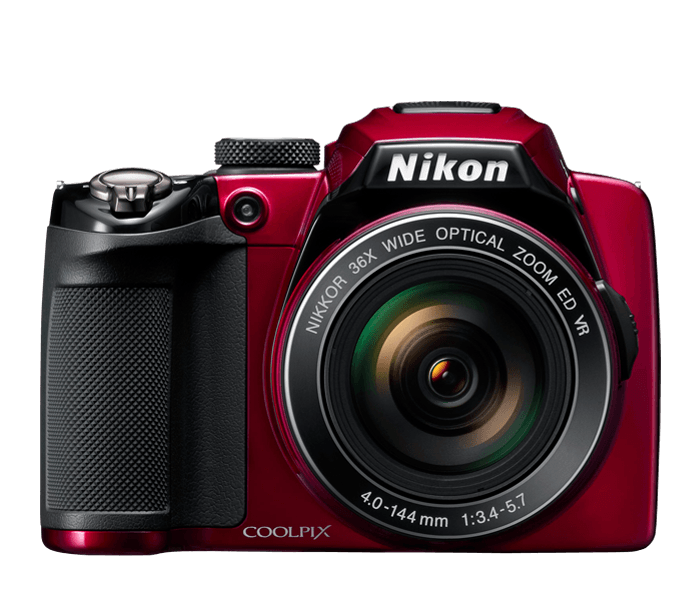 Simply move the camera as you shoot and let the COOLPIX P500 combine the shots for you. Choose from 19 different Scene Modes or let the camera automatically select the most appropriate settings. Either way, you’ll have a panoramic shot that captures the size, scope, and splendor of the most majestic scenes imaginable. Whether you’re shooting a scenic overlook or a competitive speedboat race, the COOLPIX P500 captures images the way you want them. It lets you select aperture and shutter priorities, and includes a Manual Exposure Mode that puts you in complete control. And shooting at night is a breeze with the Advanced Night Landscape and Advanced Night Portrait Modes. Simply press the shutter release and the COOLPIX P500 will shoot multiple shots and automatically combine them into a single, superior image. Whatever you’re shooting, it couldn’t be easier than with the COOLPIX P500. The COOLPIX P500 is master of convenience—and the ideal choice for capturing fast action, low-light images, panoramas, and stunning portraits. And its Smart Portrait System includes a Blink Warning that warns you when your subject may have blinked. It also includes in-camera Red-Eye technology that automatically fixes red-eye, a Face-Priority feature that can focus up to 12 faces and a Skin Softening feature that smoothes out skin tones at three different levels. This versatile camera even allows for macro shooting as close as 0.4 inches. Plus, it comes with a rechargeable Li-ion battery that lasts for approximately 220 pictures.